Someone suggested about extending the route to North Finchley. 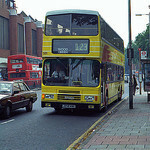 I'm not aware of the 112 ever quite reaching North Finchley, but it terminated at Finchley, Manor Cottege Tavern for many years in the early 1970s. That "someone" was, IIRC, Heidi Alexander the Deputy Mayor for Transport. It was mentioned in some broadcast she did when trying to defend the cuts to central London routes. At a wild guess it will either run via the 232 then 240 then 143 then 125 to North Finchley or take the easier option of 232 to Henley's Corner then the 13/460. The latter is what the 611 currently does. My initial guess was that it would follow the 13/460, but this would miss out the school that the 611 caters for. I wonder whether it will run via Fallow Corner then follow the 263. Wasn't there talk that the 460 was to be withdrawn and replaced with the 32 or something? There was meant to be proposal involving extending the 245 to Finchley Central & withdrawing the 460. There have been a number of "proposed" bus changes in the Brent Cross/Cricklewood area, some were hints by TfL and others from the Brent Cross regeneration developers.